Image Credits: DoD / Wikimedia Commons. Less than 24 hours after House Speaker Nancy Pelosi essentially “disinvited” him from delivering the State of the Union address on January 29th, President Trump delivered a power move that we will be talking about forever. Just minutes before a congressional delegation including Pelosi was scheduled to leave on a seven day trip to the Middle East, Trump abruptly canceled the Air Force flight that they were supposed to be riding on. Top Democratic lawmakers were literally sitting on the bus that was to take them to the plane when they found out about the news. Needless to say, they were absolutely enraged, and they began furiously working their phones in order to find a solution. But of course Trump would not relent, and everybody in the entire country is talking about this epic troll move. In fact, even CNN is admitting that Donald Trump “dunked” on Nancy Pelosi. Members are sitting on the USAF bus on CapHill they wait to see if they are departing on overseas trip Trump canceled. Fox is told there are furious calls going back and forth now between the Hill, State, Pentagon and White House. As the stunned Democrats tried to figure out what to do, the Air Force bus began circling the U.S. Capitol in an attempt to keep away from pesky reporters. The stunned officials were trying to understand whether their trip really was canceled. Phone calls and messages were flying between those on the bus and officials inside the Capitol, according to aides. Suddenly, the bus started rolling to the Senate side of the Capitol. It left the Capitol complex and drove slowly in front of the Supreme Court. Less than five minutes later, the bus was in front of the House chamber again, stunning the jacket-less reporters, photographers and camera operators who were almost sweating in 35-degree weather chasing after the bus. The lawmakers eventually got off the bus but wouldn’t comment extensively on the situation. Needless to say, things are getting personal now. Donald Trump has always said that when people hit him, he always hits back harder. And on Thursday he delivered an “epic troll move” that is going to be difficult to top. We will be talking about Nancy Pelosi’s “bus to nowhere” for a very, very long time. President Donald Trump has canceled his delegation’s trip to the World Economic Forum, citing the ongoing partial government shutdown. “Out of consideration for the 800,000 great American workers not receiving pay and to ensure his team can assist as needed, President Trump has canceled his Delegation’s trip to the World Economic Forum in Davos, Switzerland,” press secretary Sarah Sanders said in a late Thursday statement. After Thursday, the odds of a compromise between President Trump and the Democrats went way, way down. 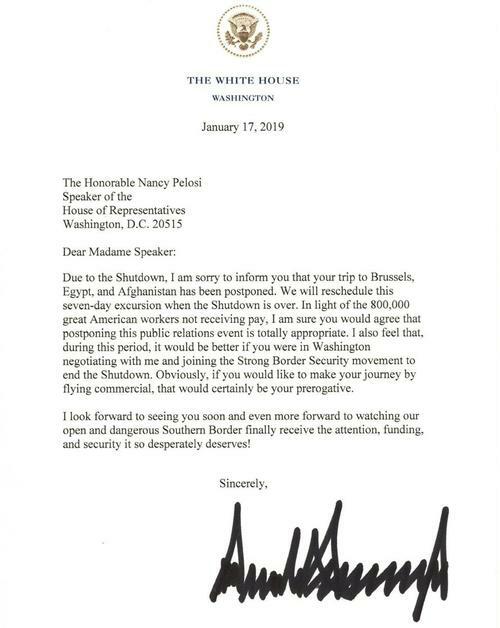 Nancy Pelosi embarrassed Trump when she “disinvited” him from delivering the State of the Union address, and now President Trump has deeply embarrassed Nancy Pelosi by canceling her Middle East tour at the last moment. Trump, of course, has made a political career of doing just this — smashing through normal behavior, acting impulsively and impetuously, taking his ball and going home when he doesn’t get exactly what he wants. If Pelosi’s political calculations make her unlikely to take the high road any time soon, Trump’s personality doesn’t even allow him to see that a high road exists.